Really, what else is there to talk about? Politics? It seems that they had a hurricane in Europe last night, 120 mile an hour winds ripping the facades off cathedrals and blowing parking structures to bits. I was struck by a photo of a two ton steel beam that was ripped off Berlin’s brand new Hauptbahnhof, completed in May 2006 by architect Meinhard von Gerkan. Nov. 28 (Bloomberg) — The architect of Berlin’s new main train station won a lawsuit against Deutsche Bahn AG in a court decision that forces the German state-owned rail company to replace the building’s ceiling with his original design. Architect Meinhard von Gerkan sued Deutsche Bahn for distorting his plan by exchanging his ceiling, designed to resemble a cathedral’s nave, for one made of flat metal designed by another architect. German copyright rules protect the integrity of work by artists and architects. While I have no idea whether the change in design has anything to do with the structural failure, the situation reminds me of another story. I spent an afternoon earlier this week with a crew from the BBC who were working on a program about the 20th century. They were especially interested in the story of the Citicorp Center, which stands on four massive nine-story tall columns and is braced against the wind by a series of perimeter trusses. According to a terrific 1995 New Yorker article by Joe Morgenstern, the building’s engineer, William LeMessurier, one day realized that the way the braces were actually constructed — bolted together rather than welded — left the building vulnerable to hurricane force winds. He insisted that the building’s owners retrofit the structural system so that it would function as designed. The Citicorp story in turn took me back to an article I’d written for New York Magazine in 1998 about how and why modern buildings might fall down. The upshot is that even the best designs can be compromised by cost-cutting or time saving moves made by the owners, the contractors, or even the construction workers. And that we don’t really know whether the buildings around us have truly been built to specification. With hurricane conditions occurring in unexpected places like Seattle in December, and now northern Europe, we’re likely to start learning some things about our buildings that we’d prefer not to know. *The photo, obviously, is not of a German train station. 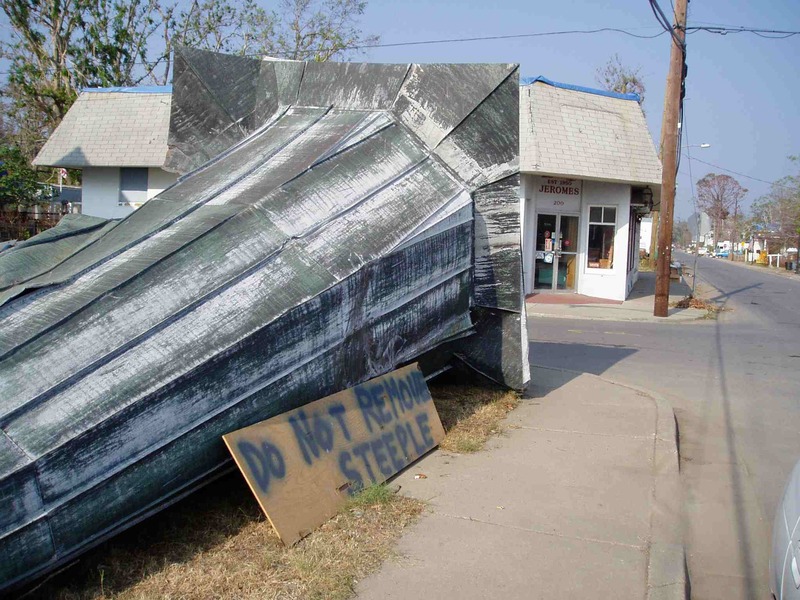 It was taken post-Katrina in October of 2005 in Bay St. Louis, Miss.